Ronnie O'Sullivan eased into round three of the UK Championship with a 6-3 win over Peter Lines but predicted more upsets because of "shocking" tables and a lack of atmosphere at the venue. The early rounds are being played on four tables at a time, not two. 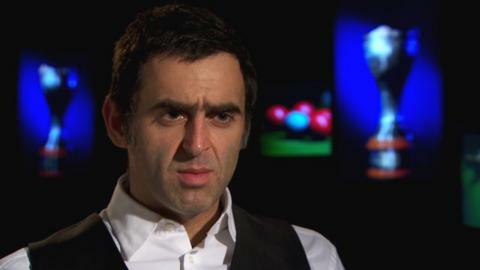 "I reckon there's going to be a lot more shocks until they get down to the two-table set-up," O'Sullivan said. "It's like asking Roger Federer to go and play on court 13 at Wimbledon in front of three men and a dog." World champion Mark Selby has already bowed out of the event, losing 6-4 to Ireland's David Morris. "I said at the start of the tournament you're going to see some really weird results this week because you've got four tables and it's not ideal playing conditions," O'Sullivan told BBC Radio 5 live. The five-time world champion said he understood the desire to include more lower-ranked players in the tournament but said a prestigious event was suffering with sub-standard tables. The 39-year-old, recovering from a broken ankle, went 3-0 up against Lines and had a break of 106 in the fifth frame. Lines won the last before the mid-session interval but O'Sullivan rolled in his century and then added the sixth on the final black. After a brief resurgence from Lines, O'Sullivan, who won the most recent of his four UK titles in 2007, clinched the match with a clearance of 33. Defending champion Neil Robertson is also into round three after winning the deciding frame against Kyren Wilson. World number 63 Wilson won a re-spotted black to level the match against Robertson at 3-3 then made a clearance of 87 to lead 5-4. He missed a golden opportunity to win the match after a wayward positional shot from green to brown, allowing a relieved Robertson to pot brown and blue to force the decider. "I certainly made it very tough for myself and it goes down as one of my worst performances in a BBC event," Robertson said. "It can be a bit difficult to motivate yourself in the first couple of rounds and sometimes, when everything doesn't fall into place, it can be hard." Northern Ireland's Mark Allen beat Luca Brecel 6-0, while 49-year-old Tony Drago, who reached the World Championship quarter-finals in 1988, lost 6-3 to Ben Woollaston.